With Windmill you can use your laptop to log and display your vehicle's fuel consumption, emissions, location and other parameters. Relatively recently manufactured vehicles will have an On Board Diagnostics (OBD) system. This monitors vehicle conditions and components that are related to vehicle emissions. The US and Canada has the OBDII system, Europe the EOBD system and Japan the JOBD system. You can interface this system to your PC and use Windmill to automatically collect the data at regular intervals. You now need some software to request data from the OBD system, read the response and log and display the data. If you wish to perform real-time calculations on the data, for example to see current fuel consumption, the software needs to be able to channel the data to a spreadsheet or similar program. Windmill software can do all these things and is currently reduced from £145 to £50. With Windmill you can interface several different devices, so you could add a GPS receiver to record location alongside your fuel consumption and emissions data. Run the Windmill ComDebug program and enter the settings needed to communicate with your On Board Diagnostics interface. Optionally, run the Windmill SetupIML program and choose names and units for your data. Run the Windmill DDE Panel and Logger programs to send the data to Excel or log it to disk. After you have entered your configuration settings with ComDebug and SetupIML, you don't need to use these again and can go straight to the logging and display programs. More details on entering the configuration settings are below. This lets you configure Windmill to acquire data from your OBD device. Follow the general instructions in our Getting Started with ComDebug and the COMIML Serial Driver page, but enter settings specific to your OBD interface as follows. These should work but check that they are the same as your interface is using. Comm Port: Select the port to which your interface is connected. Choose Add a new Message from ComDebug's Main Menu. This lets you send a message and view its reply. You need to define how to extract data. Each channel will have a specific task to request a specified piece of data from the interface. For each channel Windmill needs to send a command to request a reading, and extract that reading from the data string returned. In the Reply Parser window: enter the command needed to request a reading. For example, to request a vehicle speed reading from an ELM interface you would enter 01 0D \C013. 01 is the request for current data, 0D identifies you want the speed value and \C013 is a carriage return. For the carriage return use ComDebug's non-print menu. The 0D identifier is the PID or parameter identification number. See below for details of commands and PIDs. Repeat for the other channels. In the Main Menu choose Edit the Instrument Timings. Enter your interface's settings. These depend on exactly what you want from your system, but these settings should get you started. Read in the Background sets the device to request data and respond while working in the background. Windmill will "timeout" if no response is received in 1 second. The data persistence is how long the data will remain active. This must be longer than the rate at which you plan to read data. In ComDebug click Run to check everything is working. In the opening screen click Edit Windmill Device. Press the Add button and select your instrument files. Press Make IMS. This creates a "hardware setup file" which the other Windmill programs will ask for the first time you use them. You can edit this with the SetupIML program if you wish: setting alarm levels, renaming channels, changing the engineering units, etc. Connect your channels (eg Speed). You should see your data in DDE Panel. The data collected is in hexadecimal format which you need to convert to decimal. To do this you will need a spreadsheet like Excel. You can use the Windmill Logger program to collect data, and after collection has finished import it into Excel. Alternatively, you can collect data with Excel in real-time (detailed on our Excel page). Use Excel's HEX2DEC command to convert to decimal. Robert Kwiatkowski designed a real-time fuel consumption monitoring system for his truck. He connected his laptop to the On Board Diagnostics system of his Ford Expedition, used Windmill to collect data from the truck and Excel to calculate and display his current fuel consumption. 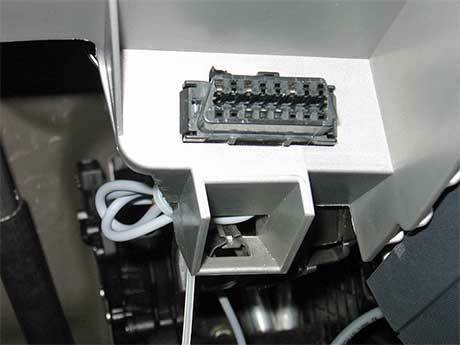 Most vehicles do not have a fuel flow sensor, therefore he used the Mass Air Flow (MAF) sensor and the Vehicle Speed Sensor (VSS) to calculate miles per gallon (MPG). Vehicles use the oxygen sensors to feedback data to the vehicle's electronic control module (ECM) and control the air to fuel ratio. This ratio is set at the chemically ideal value of 14.7 grams of air to every gram of gasoline. He could use the known values to convert the MAF to Gallons of fuel per hour (GPH) and then calculate miles per gallon (MPG). PID stands for parameter identification number. It is a hexadecimal number. For most PIDs (including all listed below) the value returned is also a hexadecimal number. One hexadecimal number is contained in each byte returned. So for a 1-byte message 2 characters would be returned, for a 2-byte message 4 characters would be returned. For a full list see an OBDII PID table. The command to request data is made up of at least two components. The first specifies the mode of operation. There are nine modes of operation in the OBD standard, but for data logging you will generally use Mode 1: Show Current Data. The next component is the PID of the data you want. If you wanted to request the current mass air flow rate you would use: 0110 (01 for Mode 1, 10 for the PID). Depending on you interface you may need to add an end-of-message character. With ELM interfaces you would add a carriage return.